Piranha Chicken: What forges a connection? Before Facebook, there were email lists (via Yahoo! Groups and other hosts) to connect with other horse-crazy lunatics people who shared your interests or profession. I subscribed to groups for opera singers and early music lovers, knitters, Alaskan Malamute owners, political scientists, with subgroups for environmental policy and constitutional law, and, of course, a group dedicated to Friesians. The Friesian list was global but it was started by a Friesian breeder in Australia so the list had a high proportion of Aussies. I joined in 1997, which was 16 years before I had a Friesian of my own. I lived vicariously through the experiences of other listees, as did other members who were Friesian-less. List members would come and go, and ugly spats occasionally ensued, but a core of frequent contributors grew to share off-topic personal info – marriages, divorces, babies, moves, job changes, accidents, cancers, etc. – in addition to all the Friesian talk. One U.S. listee even took her honeymoon in Oz so she could meet list members there. Questions from newbies about caring for those long, thick manes and tails (it's a full-time job) and keeping black coats from getting sunbleached (not possible unless you only let your horse outside at night), came up so often some list members compiled FAQs. The best posts were about someone finally living their Friesian dream, or going on their first Friesian ride, with the obligatory photos sporting the "Friesian grin". Worst were the panicked colic posts, when we waited with our hearts in our mouths for news, which was always bad – Friesians rarely survive colic. People would also post about the illnesses and deaths of their non-equine family members – dogs, parents, etc. The problem with a large global list was that there was always someone celebrating a joyous event – the purchase of their first Friesian, the birth of their first foal, a first premie award at keuring – at the same time someone else was experiencing the death of a beloved Friesian or other personal tragedy. It was an emotional roller coaster. Some days, I could not face the list, knowing that my emotions would be buffeted by events out of my control, happening to people and horses I had never met. Oh, I did meet some people. I've met most list members in New England, and their Friesians. I experienced my first Friesian ride (yes, I posted the inevitable Friesian grin photo) thanks to a list member, and the memorial portraits of my dogs are by list members, one in NH and one in Oz. The artist in NH used to have a booth at Equine Affaire, in which she hired me to work each year. I've made friends, both equine and human, thanks to the list. Once we all started connecting on Facebook, the list petered out. It still exists, but posts are rare. Most conversation has moved to Fb, either on personal pages or in the various Friesian groups. It's easier to connect on Fb but more diffuse as there are dozens of Friesian groups and none replicates the environment of the list, which felt closed and close-knit, even though there could have been any number of lurkers, just like on Fb. I mention this because last month a list member in Oregon had her barn roof collapse under the weight of unaccustomed snow, killing 5 of her 6 horses. I don't know how she and her daughter are coping with such a devastating loss. I followed the disaster on Fb, cringing at the photos in helpless horror. I found my heart going out to someone I barely know, have never met in real life, and probably never will. Members are diverse; the only thing we have in common is a love of Friesians. There are a lot of right-wingers. This wasn't as apparent on the list, when things like politics and religion were almost never discussed. But everyone's views are on display on Facebook. Horse owners are often rural people in red states, with pick-up trucks and without a college education. It's to be expected they'd be guns'n'god types but the recent election tested some online friendships. Listees who are gay saw "marriage is between one man and one woman" posts from other members, views that would never have been apparent on the list. Can liking the same horse breed overcome these sorts of differences in an increasingly polarised climate? The list member whose barn roof collapsed had recently un-friended me. I have no idea what I said to offend her, but I can only assume it's linked to the election—my anti-Trump posts have been frequent and scathing. Of course, the bigger picture window into other's lives afforded by Fb also shows how good some people are. One listee has turned out to be one of the nicest, most kind-hearted and deserving-of-all-good things people I have ever known. She is in Oz, so it's unlikely I will ever meet her, unless the plane ride gets a lot shorter and the wildlife gets a lot less homicidal. They have bad brush fires in Australia, just like in southern California. Every year as the fires rage in both places, listees in those locales are expected to check in and let everyone know they're ok. Yesterday the super kind listee told us the nearest fires to her were moving slowly in another direction and local authorities had assured everyone that there was no need to prepare to evacuate. Next post she is explaining that wind picked up, shifted direction, and the fire is at her property line. She got her kids, her dogs, and as many of her chickens as she could and evacuated with only the clothes on her back. 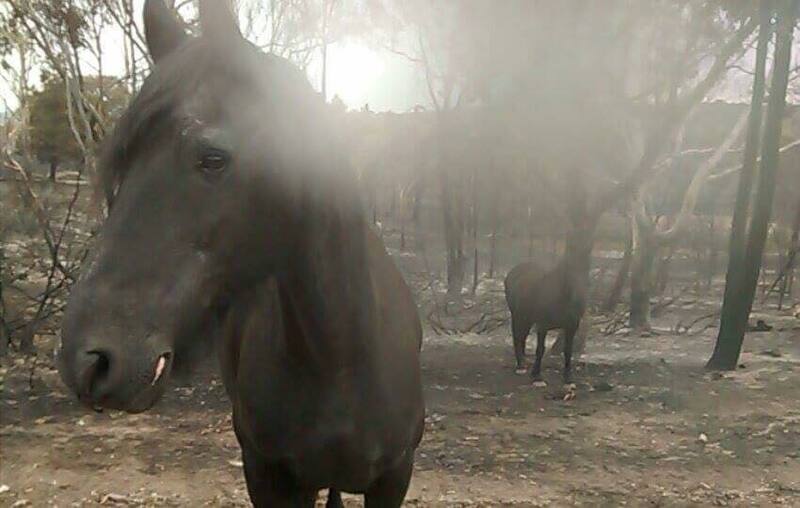 She had a hauler coming to evac her two Friesians and she wondered why it wasn't arriving. As she was forced to flee, she passed a road block – on the only road to her place – through which the police would not let the trailer pass. Needless to say, she spent a sleepless night in the evacuation centre with her family, practically puking from the fear and horror of imagining the great loves of her life being barbequed alive. She posted this Thursday night and my dreams were haunted by fears for her horses and chickens left behind. I couldn't grab my phone fast enough when I woke up Friday morning. The news reported that 15 houses had burned to the ground and the smoke was too thick to speculate about animals. Finally, a neighbour got through and was able to inform her that her house was still standing, albeit with burn marks on the brick and the downspouts melted. Every fence and outbuilding and piece of vegetation on the property was burned to the ground. The chicken coop and yard were just ashes, along with her favourite rooster, Charlie, three younger cockerels, some beloved hens, and 12 baby chicks. Her hay shed was toast, along with all her hay, feed, and tack and equipment for her horses. The only thing standing was the fence to the horse pasture, because it was made of steel. And moving slowly on burned feet and with pained lungs, looking like ghostly apparitions through the haze, came the two pieces of her heart she'd been forced to leave behind. Every patch of ground, every tree and bush in their field was charred and smoking. I can't imagine how terrified they must have been. No-one knows how they survived. I can only assume they stood in the pond in the middle of their pasture. When she posted that photo, sent to her by her neighbour, I was at the gym, on a bike, waiting for class to start. But I cried—tears of relief for the horses, and of sadness for the chickens. I have not met this woman and I probably never will. 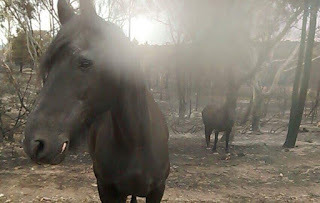 But I cared deeply that these horses survived; I've heard so much about them for the last 20 years, I feel like I know them. I felt her wrenching fear for their fate all night. I don't particularly want to; I can't take on the weight of everyone else's troubles in the world, especially when there is nothing I can do but worry helplessly. I can't say why the Friesian list has become so much tighter than other online groups. I can't say why I care about animals, and to some extent people, I've never met. (There have certainly been scammers on the list, people who were not who they portrayed themselves to be. I never fell for them—my innate distrustfulness and shrewdness come in handy sometimes.) But it seems to be human nature to put yourself in others' shoes and imagine how you'd feel if it were your babies in that fire. This isn't a political post but it makes the callousness of the right more galling, the lack of empathy. And it sure as hell makes me wish my little fuzzy guy wasn't so far away so I could hug him now.